Real Conversations is all about having honest, real conversations about tough topics facing families dealing with mental illness, addictions and more. These conversation are designed to helping families work together and come together through these tough times. In this podcast series, Mona will be sharing key strategies and concepts to help families feel safe so that they can identify where they are in the “Wheel of Progress as a Family”. With a no-nonsense approach, families are able to navigate through a variety of circumstances when afflicted with mental health and addictions. CFS ‘Gets It’, we get what others are going through. With a track record of success, the CFS process provides authenticity and credibility. Using our toolbox of strategies families are strengthened and empowered to manage difficult situations. We at CFS recognize that the entire family network is affected. We have established an entire family process at the onset of our programs. By giving the family a voice during this chaotic and confrontational time we prevent the family system from collapsing. Our program has proven to leave families intellectually stronger being honest about the issues. Families leave with the ability to focus on solutions and are able to set boundaries. Our teaching strategies address emotions of shame, grief, guilt and hopelessness. Our program builds confidence and gives families a sense of control. 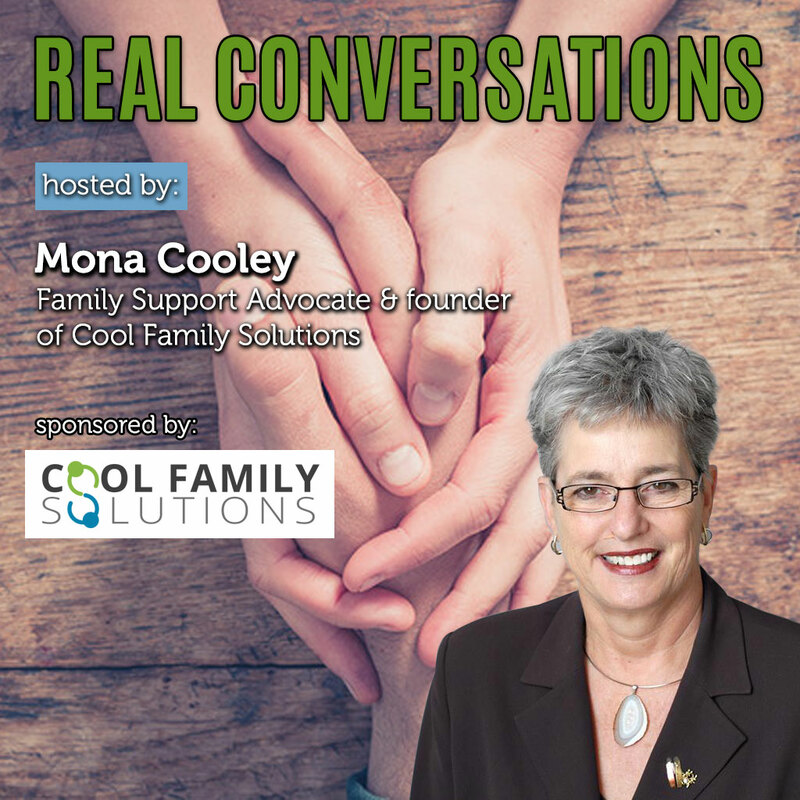 Cool Family Solutions is revolutionizing the mental health industry. Our programs are the industry leader in building confidence providing families with a sense of control. We have been recognized as providing a healing agent that will impact mental illness throughout the world. Reality of family situations go up and down. Understanding how we react to traumatic situations, what we feel and think when we go through them and what we do to work through the situation. After the storm is over, calmness sets in and what happens next will either improve the situation or cause deterioration. The action taken will either have you ready to make changes now or not. Today the Real Conversation is about the “Reality Of Emotions.” Emotions kick in when overwhelmed, frustrated, scared or anxious about a situation. What do you do about these emotions – stuff them, mask them, work through them and/or reach out to talk to someone you feel comfortable talking about them? Emotions happen. You are not alone. Today is about exploring emotions. The topic today is asking the question – what’s next after dealing with a difficult situation and all the emotions that go with it. Difficult situations can be the time to take stock of what happened and ask what can I learn from this. This is not the automatic thing when you been through difficult times. You are wondering what to do, feeling overwhelmed and trying to work through it. I get how taking stock of your situation is not the first thing that comes to mind. Barriers, blocks and changes needed to turn a difficult situation around from constant battles to calming times. What expectations do you set for yourself? What subtle expectations are you setting for others to live up to? Discussion reveals how doubt, disappointment, guilt rushes in with expectations. Learn what is happening and deal with the barriers in your life. Phases: Education 3) Roles & Responsibilities vs Support (enabling & rescuing) Expectations. Have you ever tip toed around a difficult situation? You are trapped whether to say anything or do anything or leave it alone and hope it goes away. Hearing about a tip toeing experience tells the other person - you are not being yourself and they hesitate to say what they want to say. Trusting someone is key to whether you can be open and share what is truly felt and thought. Consistency of whether to trust or not trust is a test of whether you will be yourself or pretend to be somebody you are not. In today's podcast, Family Feedback, we hear from families who have experienced what they can trust. "I need help" is a big step to bringing relief to a difficult situation. Saying this is the beginning of your willingness to face the challenges head on and learn how to change situations that cause conflict, broken relationships, and sadness to tears of joy. Everyone has skills, they are used everyday and done the same way UNTIL they are not as effective. The flip side of the skills is they need an adjustment but we don’t know what to change or know where to begin. Flipping them and tweaking them can make a difference. What do I mean by flipping? Looking at skills with a different perspective and being open to hearing something different. PS stands for Problem Solving. I heard it said “problems are an addiction”. The economy is certainly compounding the problems with stressful situations mentally thus creating more problems. Stress affects you, your family and others. Yes there are problems BUT how do you work through the problems? Learning tools, strategies, insight is fabulous IF we apply what we learn. A few things happen such as running home and apply immediately or we try once and decide it doesn’t work or don’t try it, or continuing to do the same thing, Don’t waste your time learning something if you are not going to try it. Remember you can tweak ideas to fit for you and yes you can scrap it if it is not working for you. Applying and tweaking ideas consistently help you to have them ready when you need them. Get a GRIP on this and watch life a smoother ride.